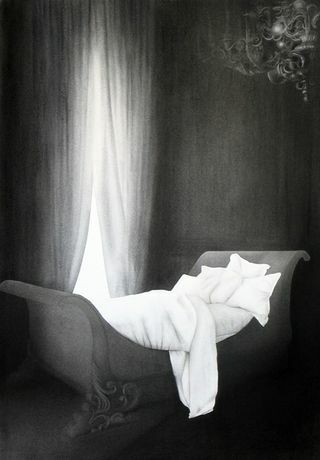 Artists Fran Richardson and Ruth Wallace have different approaches to similar themes of absence in a domestic setting. Fran's drawings exploit the blackness of the charcoal to create a dark, shadowy, unhomely place where unusual furniture and objects emerge from an endless void. Areas of the paper are left exposed for dramatic contrast with the dazzling light acting as a barrier to the possibilities beyond the confines of the architecture. Ruth makes large-scale drawings in charcoal, graphite and mixed media. Her recent work, which centres on portrayals of women's clothing, explores the dichotomy between absence and presence and the homely and the disturbing in relation to the domestic interior. It also addresses issues connected with memory and female identity and is informed by the distinctive visual style of film noir.